The Nubia Alpha, which features a four-inch flexible screen manufactured by Visionox Co Ltd, a supplier of organic light-emitting diodes or OLED, has all the features and functionality of a phone but wraps around the wrist like a smartwatch. Priced at 3,499 yuan ($521), the device supports text messaging, mobile payments and voice calls either through its built-in speaker or a connected Bluetooth headset. As a smartwatch, the Nubia Alpha works as a fitness tracker and can measure heart rate. The Shenzhen-based company said it is teaming up with China Unicom in promoting the eSIM card, which is directly embedded on the phone chip instead of adding it as a separate removable component to the phone. The partners will also carry out cooperation in the 5G smartphone sector. "The independent communication function is of great significance to wearable devices, and will become a key foundation for the application scenarios of other internet of things devices," said Pan Xuefei, a senior analyst at market research firm International Data Corp, adding that she is bullish on the prospects of the wearable smartphone sector. 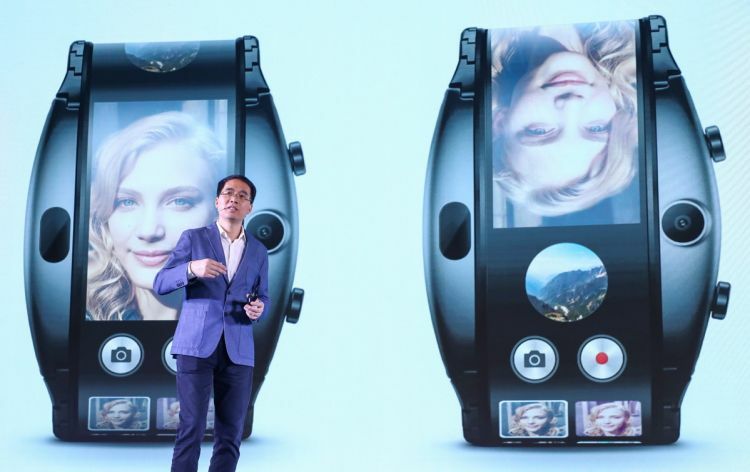 "The growth potential of the smart wearables sector is obviously bigger than the traditional smartphone sector, buoyed by the development of fifth-generation wireless communication technology," said James Yan, research director at Counterpoint Technology Market Research. The worldwide market for wearable devices grew 31.4 percent during the fourth quarter of 2018, reaching a new high of 59.3 million units, according to IDC. "Smartwatches, meanwhile, grew 54.3 percent and accounted for 29.8 percent of all wearable device shipments in 2018," said Ramon Llamas, a research director from IDC. "Apple accounted for nearly half the market and was followed by a long list of companies that posted double and triple-digit growth. What resulted from this was a growing list of devices available at multiple price-points to meet the needs of a diverse market." Xiaomi captured the second position among the top five with a 12.6 percent share, followed by Huawei and Fitbit. Jia Mo, an analyst with global market research company Canalys, said that although he is not optimistic about the shipments of such wearable smartphones, Nubia may improve its brand competitiveness through launching this product, boost the overall sales of its smartphones. He said how to find a balance between product performance, user experience and price is highly crucial to the sales of a product.